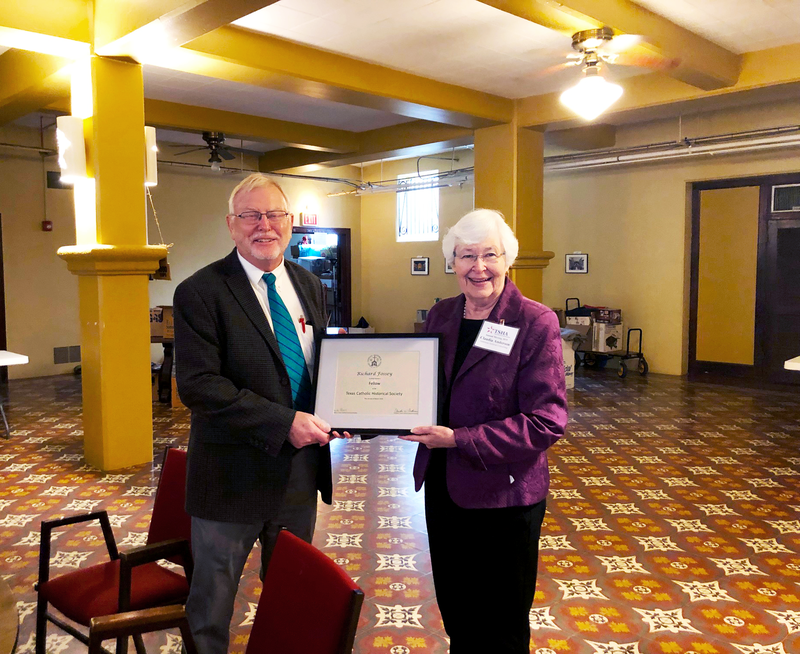 During the March 1st annual meeting of the Texas Catholic Historical Society (TCHS) in Corpus Christi, EDFL professor Richard Fossey was named a Fellow and presented with an award for his work with the organization. Dr. Fossey is in his ninth year as Editor of Catholic Southwest: A Journal of History and Culture, TCHS's scholarly journal, which features essays on aspects of the Roman Catholic heritage of Texas and the Southwest, focusing not only on history, but on the Catholic experience expressed through art, architecture, literature, music, and other related subjects. The 2019 issue of Catholic Southwest will be devoted to Catholics in politics and will include an article about Lyndon Baines Johnson's relationship with Catholicism. The 2018 issue was devoted to the Cristero War in Mexico (1926-1929). Below: TCHS President, Claudia Anderson, presenting Dr. Fossey with the award.